My 5yo came home with a bag of things from gan, pictured here. 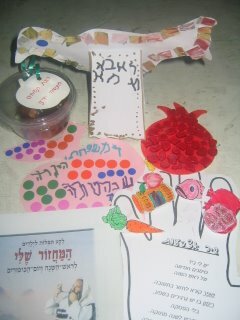 They include gan-made apple jelly, a card, a hand with “simanim” for the holiday attached to the fingers with velcro, a glossy pamphlet called “My Machzor” with a selection of holiday prayers, a pomegranate decorated with red plastic thingies, and a stand-up card wishing his parents “Shnat briut” (year of health). Nice choices and not too extravagant. I hadn’t taught him to write Hebrew letters so I was pleased to be able to read what he wrote. Presents for Rosh Hashana are very big in Israel; it’s comparable to that holiday in December. The newspapers run stories on what workers from each company are likely to get. I was one of the last parents to get to gan (meaning I wasn’t yet standing outside when they opened the gate) and the ganenet was eager to tell me what had happened. They made a picture with all the children’s names and each child had to name a wish for the new year. Apparently my son couldn’t think of anything to say, so they finally suggested something one of the other children said. I was hoping it would be a healthy recovery for someone who was sick or world peace or something, but he ended up saying that he should have fun in the new year. They seemed to be impressed that he didn’t want anything in particular. When I asked him about it, he said that he had wanted to say a ball, but he remembered that when we were in NY he was able to pick out a present for his birthday from his grandfather and he had already chosen a ball. We still have it. So that’s why he didn’t need to ask for anything. May Hashem answer all of our prayers this Rosh Hashanah, and inscribe us and the entire Jewish people for a good year. Leshanah tova tikatevu vetehatemu. Sounds like your son is “happy with his lot.” That is so plesant. I never knew that present time in Israel was around Rosh Hashanah. That is really interesting. I am finally up and down and I have things on the stove. 🙂 It is thrilling. Shana Tovah. In the machzor my son made, they had a page about what they were going to daven for on R”H. My son is going to daven that Hashem will come and clean his basement (his playroom)….I cracked up.